This morning I received the sad news of vibraphonist Bobby Hutcherson’s passing on monday at the age of 75. Here is an obituary from the New York Times. I never had the chance to see any of the great vibraphone players of the 20th century (Hampton, Jackson, Hutcherson, Dickerson) play live. But for youtube’s sake, we have the chance to see them all in action (not that it’s a comparable experience). In 1989 Bobby Hutcherson was runnnig the european festival circuit with the band that was either announced as “The Phil Woods / Dizzy Gillespie All Stars” or as “The Dizzy Gillespie / Phil Woods All Stars”, depending on whatever. It seems this band played every major and minor european festival that year, and fortunately most of the times some TV station was broadcasting at least parts of the proceedings. 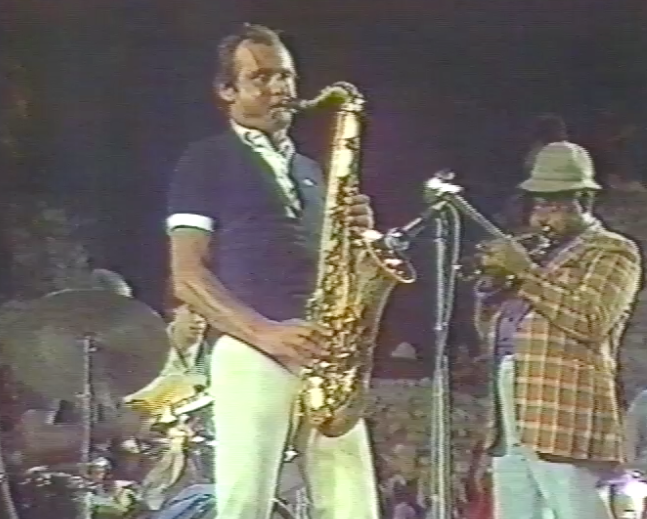 In the VHS collection of my friend, the late swiss jazz researcher Otto Flückiger, I found a nearly 13 minute clip of the All Stars playing Gillespie’s composition “Tour De Force” at the Jazz Festival in Wiesen, Austria on Saturday, July 8, 1989 – which has never been on youtube before. So here’s my tribute to the late great Bobby Hutcherson. The band consists of Dizzy Gillespie (tp), Phil Woods (as), Bobby Hutcherson (vib), Steve Turre (tb), Cedar Walton (p), Rufus Reid (b) and Mickey Roker (dr). And Hutcherson has a nice solo in there. … and please excuse the TV noise in the background, I could not do anything against this. Back in the late eighties I was working as a humper. Humpers are the people that carry equipment around before a gig. You might think that these people are called roadies, but then you are wrong. Roadies are the people that tell the humpers where to put the heavy things they are carrying around! The company I was working for did mostly rock concerts, but also some different festivals and shows. 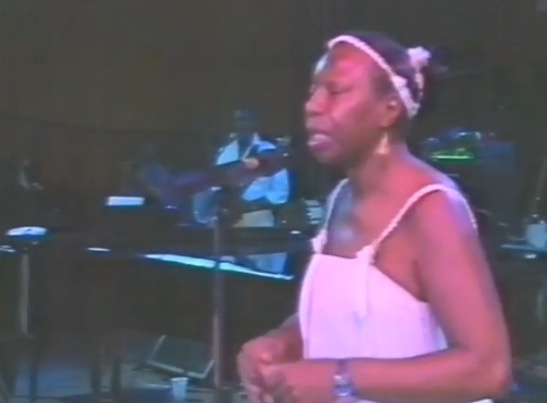 In some summer in the late eighties we were doing some sort of city festival in Cologne and I was glad to see Nina Simone on the programme. But alas, Nina was in a very bad mood that day – and for a reason. They had relegated the great singer and pianist to a side stage. In fact she had to play on an upright piano placed on a truck! In front of nearly no-one! I remember her as being quite aggressive and stopping the concert after 20 minutes, she was really pissed. I understood that well, but I thought it was a pity just the same because the people that were there, were there for her. Luckily I found some footage of Nina in a good mood on VHS cassettes in Otto Flückiger’s collection. The two clips I am presenting here come from the Jazzgipfel Stuttgart in 1989, so they might be from the same tour that the Cologne city Festival was part of. Nina’s band members are on guitar Al Schackman, on bass Chris White and on drums Paul Robinson (thanks to Gerrit de Bruin for information!). And here’s part 2. Watch Dizzy Gillespie give Nina some flowers at the end! Almost a year ago I discovered some nice footage of Dizzy Gillespie and Stan Getz in 1978 playing “I Can’t Get Started”. 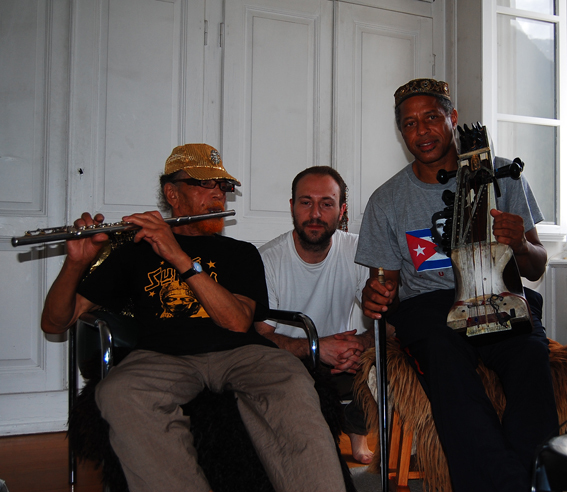 coming from the series “La Grande Parade du Jazz” concerts in Nice, filmed for french TV. I thought I could put up the rest of the footage as well. So here you have Dizzy Gillespie, trumpet; Barney Wilen, Stan Getz, tenor sax; Andy Laverne, piano; Rodney Jones, guitar; Mike Richmond, acoustic double bass; Mickey Roker, Billy Hart, drums, percussion at the Grand Parade du Jazz, Nice, July 14, 1978. playing “Night In Tunisia” – which is soon interrupted by heavy rain. On the second segment (Improvisation/Ceciliana) Dizzy is accompanied by Hank Jones, Milt Hinton, J.C. Heard. Here is another nice and short one from the series of “La Grande Parade du Jazz” concerts in Nice, filmed for french TV. Here you get Dizzy Gillespie, trumpet; Barney Wilen, Stan Getz, tenor sax; Andy Laverne, piano; Rodney Jones, guitar; Mike Richmond, acoustic double bass; Mickey Roker, Billy Hart, drums, percussion, playing I Cant’ Get Started at the Grand Parade du Jazz, Nice, July 14, 1978.